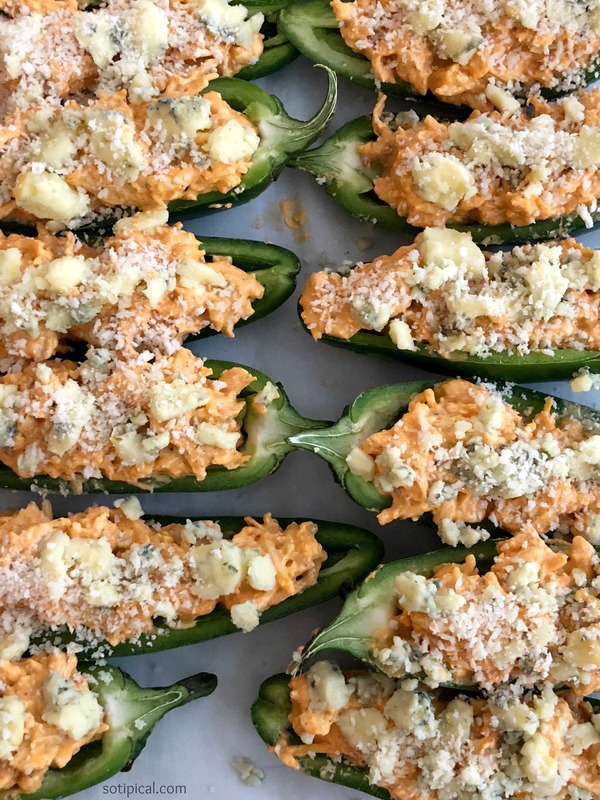 If you love Buffalo chicken and jalapeño poppers, then these Buffalo Chicken Jalapeño Poppers are for you! We love them so much that we may have inhaled eaten them for our dinner last night with some celery and carrot sticks on the side! Its a busy time of year and I usually spend more time planning and cooking for others. While I love to entertain, I never get to stop and enjoy what I cook because I’m focusing more on being the host. Plus, by the time I actually get to eat, the food is often gone! My family loves appetizers and sometimes we just have them for dinner instead of making an entree. As a treat, I will make some appetizers for dinner on a weeknight, because everyone will make the effort to carve out some time so we can slow down from our busy days and catch up. 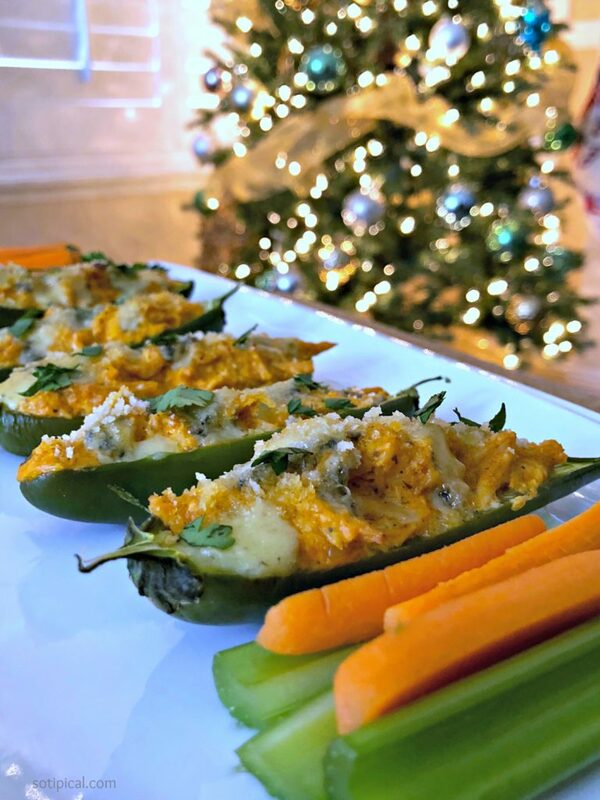 Buffalo Chicken Jalapeño Poppers happens to be one of my favorite appetizers because it incorporates two things I love – jalapeño poppers and buffalo chicken. 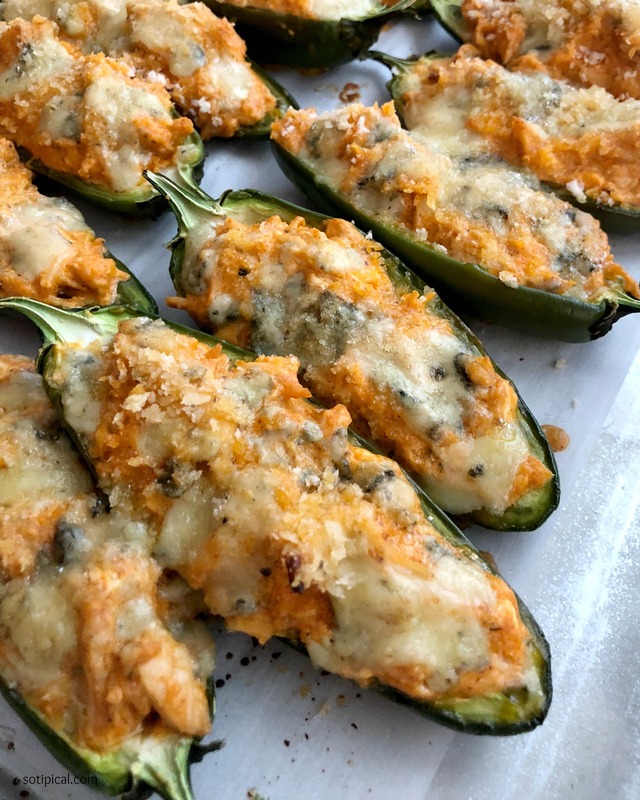 I have been making baked jalapeno poppers for years. I’m not a huge fan of deep fried foods, plus I will always prefer a lower calorie recipe. Instead of batter, I use Panko breadcrumbs over the top for a little added crunch and it is every bit as tasty and delicious! Preheat oven to 350 degrees. Remove your cream cheese from the refrigerator at least 20 minutes ahead of time so it begins to soften. 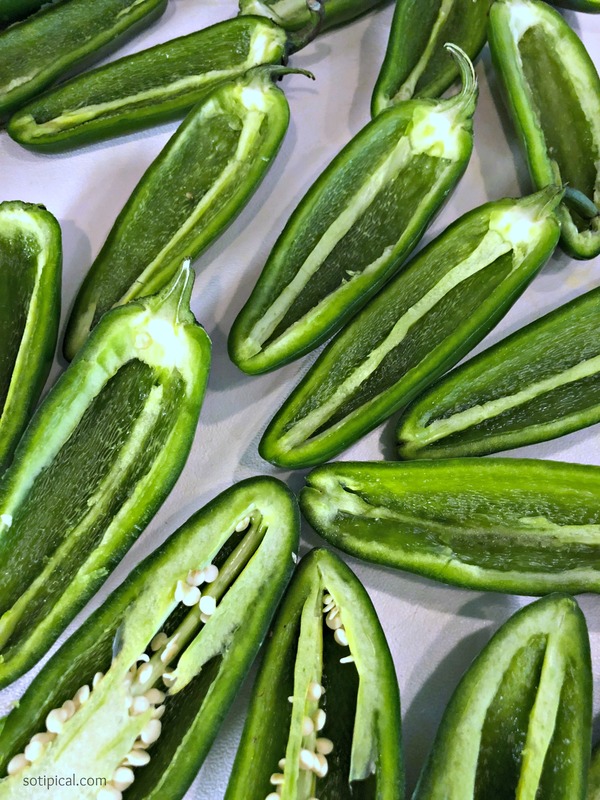 Clean your jalapeno peppers and slice them in half, longwise. Remove the seeds and discard. Most of the heat of a jalapeno pepper is in the seeds. If you handle them with your fingers, be careful about touching your face afterwards. Especially your eyes! Make sure you clean your hands very well! Once done, line them up on a baking sheet lined with parchment paper, then set aside. In a large bowl, add the cream cheese, Buffalo wing sauce and ranch dressing. Carefully mix until it is well blended. Now you will add the shredded cheddar. 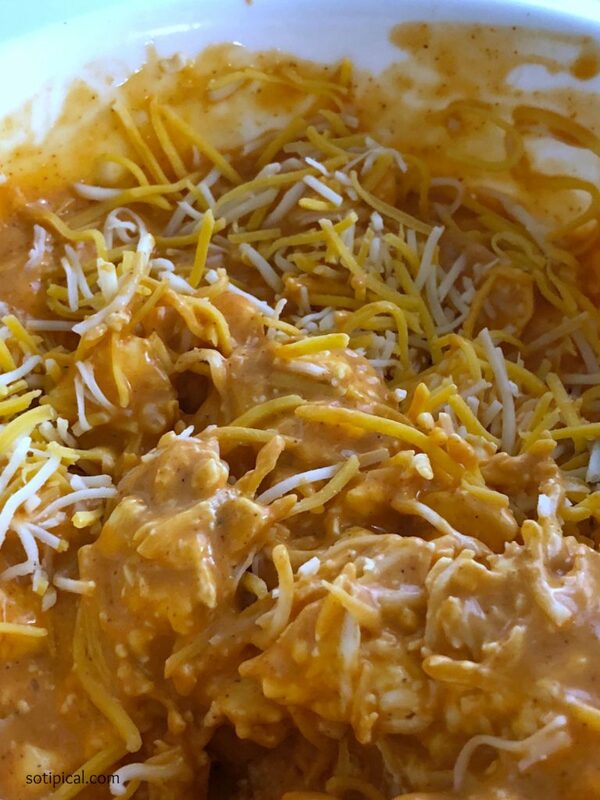 Add the shredded chicken to the Buffalo mixture and be sure that all of the chicken is coated with the Buffalo sauce. Now you will fill the jalapeno peppers with the Buffalo chicken. 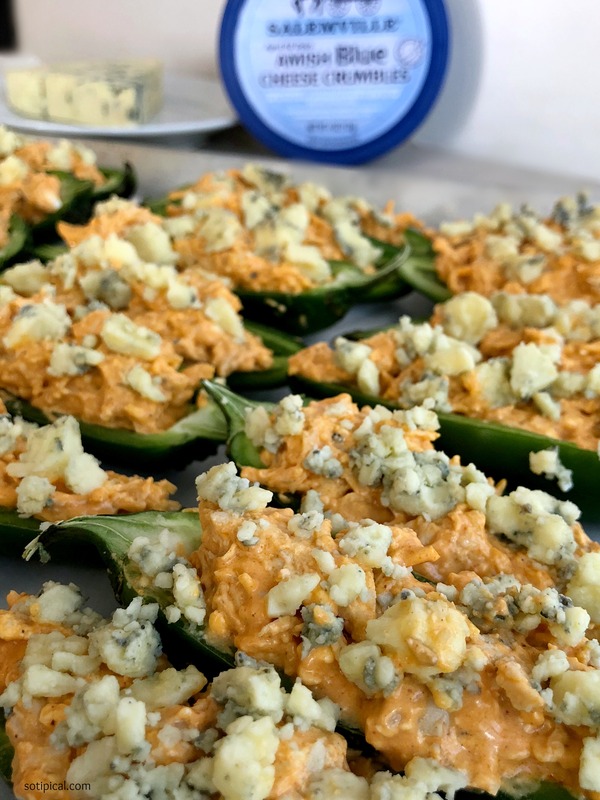 Top each pepper with Salemville® Blue Cheese Crumbles. Then sprinkle Panko breadcrumbs on top. Bake for 25-30 minutes. Serve immediately and Enjoy! One of my favorite parts of this dish is the Salemville® Blue Cheese! Salemville® offers Artisan Blue and Gorgonzola cheese varieties, that have well-balanced flavors and aren’t over-powering. I grew up in the northeast, where I was introduced to Buffalo chicken wings. They were only served with Blue Cheese dressing for dipping and I loved it! It wasn’t until years later, when visiting California, that I saw ranch dressing being offered. 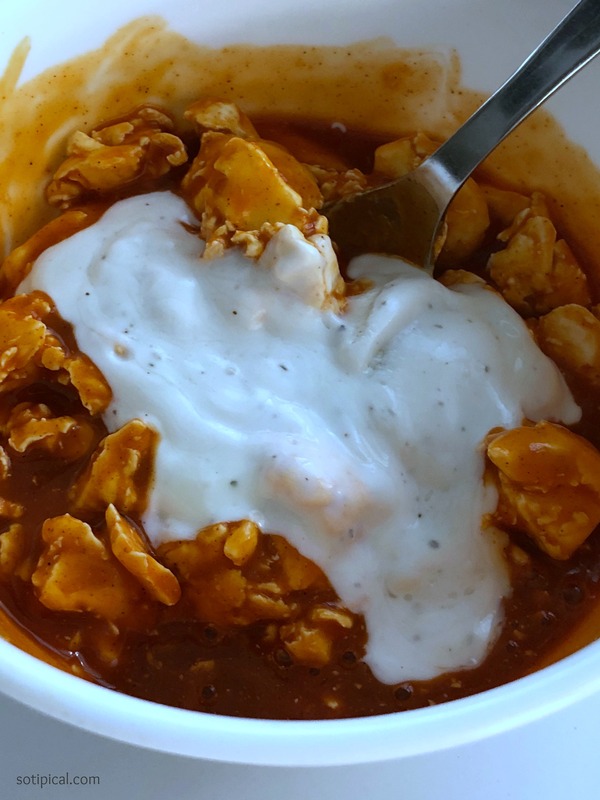 Ranch with Buffalo chicken just “wasn’t a thing” where I grew up. Click On Image Below So You Can Enter To Win A Grill Smoker From Salemville® This Holiday Season, Valued at $1000! You may enter once per day to better your chances! Contest ends on December 31st. Good Luck! Pin This Recipe By Clicking Image Below! My family would inhale these, we love blue cheese! I like how you added the blue cheese right to the popper itself, most of the time it’s added to some kind of dipping sauce and the blue cheese flavor gets lost. OMG! This is what I have been looking for. It’s a combination of our favorites. Will definitely try this as soon as I have the ingredients available. Thank you for the inspiration. 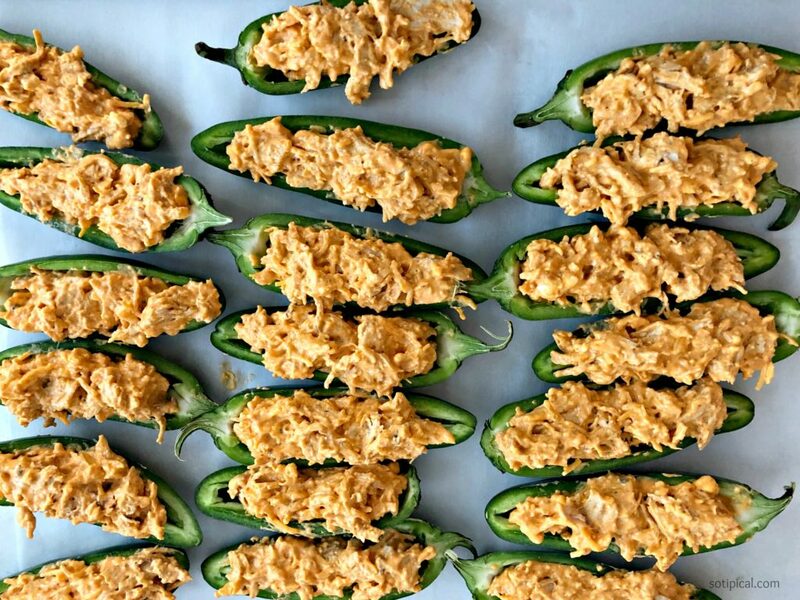 This buffalo chicken jalapeno popper is a must-try.